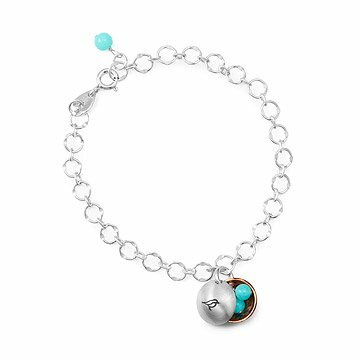 Like a mother bird?s wing, each sterling silver dome perched on this bracelet protects an Amazonite "egg." Like a mother's wing, the sterling silver dome threaded onto Trudy James' bracelet protects the precious treasures inside. A hand-textured copper nest cradles Amazonite "eggs." Hand-stamped with a sweet bird silhouette. Hand-crafted in San Diego. Click here to see the matching Nest Egg Necklace! Please see care instructions included with bracelet. Due to the natural characteristic of these stones, some colors may vary. We cannot guarantee the color in the photo will be exactly as those used by the artist. I love your products as they are handmade and simply dear! To remind me of my three beautiful daughters who gave me 9 wonderful grandchildren! Love, Love my Nest Egg Bracelet! My son purchased the Nest Egg bracelet for me for Mother's Day and I have to say it is very very nice and the thought behind it says it ALL! I love it! I bought this for a good friend whom is becoming a mom for the first time. At first seeing it online I thought this was a perfect gift for her, but after receiving it, I was amazed because it looked even more spectacular than I expected. It's meaning and construction of the item should cost more than it did. Any reasonable individual would think it's worth more than it does. Only thing that could be better is the clasp. I bought the matching necklace last year for Mother's Day and my Mother loved it very much! She said the gift wrapping was so beautiful she didn't want to open it. This year I bought her the matching bracelet and like the necklace it was perfect! They absolutely beautiful! I would definitely buy from Uncommon Goods again and have recommend to others. Mom wears it every day! I bought the matching necklace for my Mom last year so this was the perfect choice for this Mother's Day! She absolutely loves the bird nest with her three "good eggs" inside. I gave this to my sister-in-law for Mother's Day. She has three children but lost her 22 year-old son a couple months before Mother's Day. I thought the three eggs in the nest let her know that she is still the mother of three children, even though one is no longer on this earth. A perfect gift for a Mother of 3! I didn't even take it out of the little bag, but wrapped the whole thing knowing that it was the perfect gift. When my mom oped the gift she loved not just the bracelet but also the meaning that goes with the bracelet. This is a great gift to give to someone to someone that has kids. Gave this to my mother for Christmas. She loved it! My friend received this from me as a birthday/mothers day gift. She was delighted and wears it almost daily!